LEDGlow’s Million Color Golf Cart Interior Lighting Add-On Kit is the perfect complement to your Expandable Million Color LED Golf Cart Underbody Lights Kit by further enhancing the look and feel of your golf cart by adding ultra-bright SMD LED lighting to the footwells. LEDGlow’s Million Color LED Golf Cart Interior Add-On Lights Kit features (4) 8” Interior Tubes, consisting of a total of 24 SMD LEDs that illuminate the footwells of your golf cart. This kit cannot be used by itself, and functions in tandem with the Underbody Lighting Kit. Each tube plugs directly into the 12 port junction box included with the underbody kit. It’s that easy! 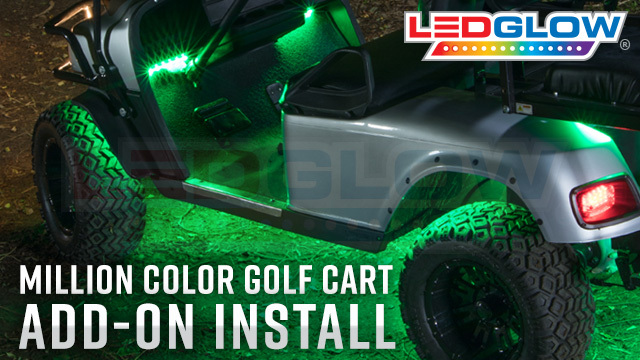 LEDGlow’s Million Color LED Golf Cart Interior Add-On Lights Kit includes (4) 8” flexible tubes, along with everything needed for a seamless installation, including foam taps, screws, zip ties and installation instructions. LEDGlow includes free lifetime technical support and a one-year limited warranty with each purchase. Note: This interior add-on lighting kit is only compatible with the current generation Expandable Million Color LED Golf Cart Underbody Lighting Kit (LU-GC-M40.1). These lights are amazing. So glad i finally bought them. If you are debating. Debate no more. These are the lights for you. P.s. I have never left a review for anything before. Thats how good these lights are. Recently tried 5 different brands of Bluetooth LED's all failed to connect! I purchased 5 different brands of LED's, all failed to connect to anyone's Bluetooth. I decided to just move on to a tried and true method of manual and remote control LED's. These worked fantastic, it was a fairly simple install. Remote works easily enough and the lights look great. I purchased the Wheel well kit and interior kit to complete the look. The install was quick and simple a few self tap screws, zip ties and a quick plug in and the install was complete. I installed a toggle switch on the cart dash for an addition on/off option. Great products, easy install and multiple ways to control the functions. You simply can't ask for more. Honestly, the Bluetooth function is kind of a pain IMO. I'd rather have the remote on the key and push it, rather than breaking out my phone and running through apps which drain my phones battery.